Along the lines of my “1965 was a cruel summer” theory for female soul singers: There must have been no worse place to be one than at Motown Records. As The Supremes broke age, race and gender barriers with 5 #1 Pop hits and appearances in remarkably mainstream venues, at least a dozen women at Motown waited for their chance. From as prestigious as Martha & The Vandellas and The Marvelettes, to bright eyed ingenues like Carolyn Crawford, everything stalled while The Supremes went into orbit. For 16 year old Carolyn Crawford, who had won a contest as her way to the label with her self written composition “Forget About Me,” it seemed like fate would never deal her the hand of success she deserved. 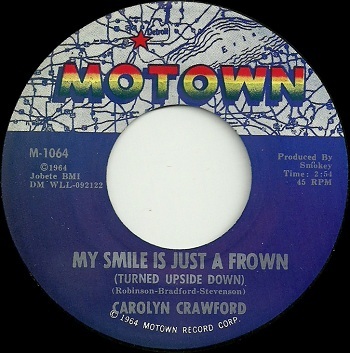 Her amazingly pretty minor hit “My Smile Is Just A Frown” languished at the base of the R&B Top 40 despite no promotion. Smokey Robinson continued to give her the occasional gem, like this lilting number reminiscent of an updated “My Guy” that *Could* have been hit material, had she not sat about 7th in line in pecking order among female Motown vocalists. Pity it took nearly 50 years for this beauty to surface.